The task is to move existing sections that were built on top of RoR, with assets served with the rails asset pipeline. the files should be completely independent, loaded in a smart & efficient way. 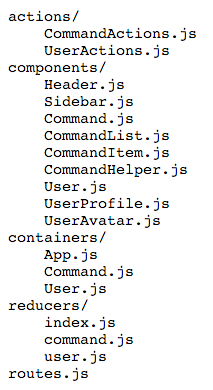 The stack we decided to use was React with Redux, and Webpack as our build tool. It felt like a good start, because everything, literally – was in one place. all reducers, all actions, all components – in one place. it was quite easy to kick start and dive into work. but, as the application grew, and more components were added, we reached to a point where the navigation in the code became complex and time consuming. at this point we decided to look for a better solution. Inspired by this lovely article. It allows us to better consolidate components, and their respective actions, reducers and constants. basically a complete separation of mostly independent components. Another perk by using this approach – the navigation in your IDE became much easier, and you don’t have to rely on seeing in which directory your file is located. Because we need to work on multiple sections that will be built with react, and we don’t want to configure same settings over and over, we want webpack to output a dependencies file, and section file(s). dependencies file – will hold any cross section relevant dependancies, like react, react-dom, react-router, isomorphic-fetch, etc. section file(s) – each file will be name as react-<section>.js and will hold only it’s section relevant code. externals are modules that we don’t want to include in our webpack build, but we do want it to be accessible from within our modules. the ‘_’ is the object name by whom it will be referenced. List of plugins that are used to optimize webpack’s output. ProvidePlugin – allows us to provide the modules in the list as plugins, available globally in any file, instead of requiring them every time at the top of each file. we do that for our dependancies files. (not recommended to use for non globally used files). DefinePlugin – defines a global variable, that holds our NODE_ENV var. to be used to separate production/dev/test builds for instance. OccurrenceOrderPlugin – Assign the module and chunk ids by occurrence count. Ids that are used often get lower (shorter) ids. This make ids predictable, reduces to total file size and is recommended. DedupePlugin – Search for equal or similar files and deduplicate them in the output. CommonsChunkPlugin – Allows webpack to determine commonly used chunks of code, and pull them into a single separate file. UglifyJsPlugin – Minifies & uglifies the output, reduces the output size drastically.